DAMASCUS, (PIC)– Dr. Ramadan Shallah, the secretary-general of the Islamic Jihad Movement, on Friday called on Fatah faction to stop obstructing the reconciliation efforts and wagering on the peace process with the Israeli occupation authority (IOA). During a ceremony held in support of occupied Jerusalem and the national unity, Dr. Shallah stressed that the option of negotiation would never create the Palestinian state, noting that if the IOA had wanted the establishment of a Palestinian state, it would have given it to late president Yasser Arafat. “The Zionist entity creates wars in the region and not peace. We must not mistake this at all. The making of wars is one of the requirements of maintaining the legacy of colonialism, the equation of Sykes-Picot, and the reality of hegemony and control over the Nation,” he underlined. 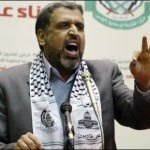 The Islamic Jihad leader also shed light on his Movement’s relationship with Hamas and Fatah, saying that his Movement is biased in favor of these two factions as much as they are biased in favor of Palestine and the resistance. For his part, Sheikh Nafid Azzam, a member of the Islamic Jihad political bureau, stated during the ceremony that the option of negotiations pursued by the Palestinian Authority (PA) proved its futility and called on the PA to return to the national dialog aimed to restore the unity. Sheikh Azzam highlighted that the resistance is the most correct and feasible option for the defense of the Palestinian people and the protection of their rights. “We confirm the sterility of the so-called peace process, and Barack Obama who was unable to force Israel to freeze settlement activity, would be unable to make it withdraw (from occupied Arab lands),” the Islamic Jihad official added.